Home | Discount Leotards ™ > Grips, Grip Bags, Balm, Etc. > Bailie X-treme Extreme hook and loop, and buckle, regular width ladies uneven bar grips with removable wristbands (1 pair). 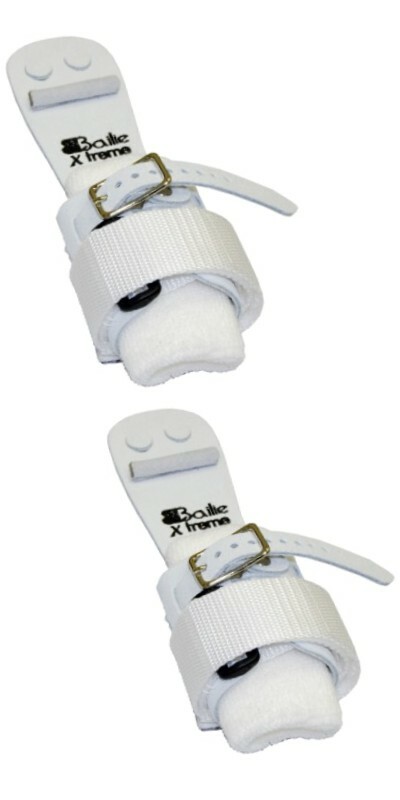 Bailie X-treme Extreme hook and loop, and buckle, regular width ladies uneven bar grips with removable wristbands (1 pair). Women's uneven bar dowel grip - regular width. Bailie's newest grip. Get the best of both worlds with the added security of a buckle and strap!! the palm piece has a leather wrist band sewn onto the grip. The dowel is glued and sewn onto the grip. Bailie - setting the standard! Made in the U.S.A. This standard width grip combines a 1 ½” Velcro strap with a narrow buckle. The buckle allows the gymnast to really tighten the grip down on their wrist. The hook and loop strap helps spread the tension along the wrist and reduces the wrist irritation. The combination really helps keep the grip in place. We suggest this grip for the higher-level gymnast or one that has used grips before. Includes a pair of 4” terrycloth wristbands with the grip. Available in sizes 00-5.